If India is to shine now and in the future, people must have the freedom to decide and while governments can be in the business of monitoring, they should have no role in telling people what to do, said Mr. Ratan Naval Tata, Chairman Emeritus of Tata Sons. “If India should shine let the people have the freedom to decide” Mr. Tata said in an interactive session with SRM University students here today. “As you go through life, many things you could not find in college, you will find it in your profession down the line” Tata told students stressing that there are many qualities that are sought after in young leaders but the bottom line must be one of making a difference. “Be honest in what you think and do and this goes for any profession”, the industrial and business magnate remarked. Prior to the interactive session with students drawn from all Faculties of SRM University—Engineering and Technology, Science and Humanities, Medical and Dental Sciences, Health Sciences, Management and Law—Mr. Tata had meeting with the Founder Chancellor of SRM University, Dr. PaariVendhar where they discussed the challenges and opportunities of higher education in India. Referring to the fact that so many young minds of India choose overseas destinations for higher studies, Mr. Tata observed that this would not be the case if educational institutions offered proper facilities and faculties. 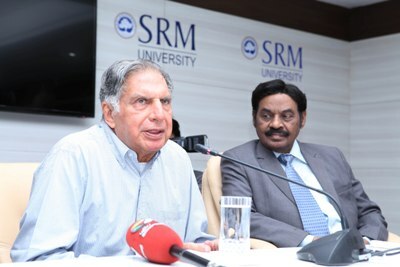 Lavishing praise on the state of the art facilities at SRM University and endorsing the institution’s plans for the future, Mr. Tata told young minds that along with team work, timing, plan and innovation, there has to be intuition for any program to succeed; but at the same time not every plan or venture is going to succeed. “Take everything as a learning exercise”, Mr. Tata advised the student community. Lamenting the fact that India still did not have a basic health care network and a country where is still a social stigma on disability, Mr. Tata argued that both the public and the private sectors need to go the distance in addressing the needs of the under privileged and specially challenged people. “ Less attention has been given to disability oriented vehicles and we don’t even have a ramp in many pavements to address the needs of people on wheel-chairs”, Mr. Tata said in appreciating the query posed by the student. Asked on his parameters of support to start-ups, Mr. Tata argued that while he is interested in the ideas of the young minds on projects, his support to any will also depend on not only viability but also in an assessment of “greed” of the entrepreneur. “I like investing in young companies, but money-alone and greed is not what I am for”, Mr. Tata said. Accompanied by the Vice Chancellor, Prof. Prabir Bagchi, Mr. Tata, at the end of the interactive session with students went on a tour of SRM University.